Wild and wondrous, of the olden time". What do we mean by "paleoclimate"? What evidence exists for ancient climate change? What causes the climate to change? One of the most pressing concerns for humans on Earth today is climate change, and what will happen in the future. Given that the climate is definitely warming, it is logical to ask two questions: First, have such changes happened before in the history of the Earth? And second, what is causing this change? In the next two lectures we will examine past climates (paleoclimates) and the forces that caused them to change. This information will set the stage for asking if the same forces that caused past changes are causing climate warming today, and for making predictions about what will happen in the future (upcoming lecture on climate models). From abundant geological evidence, we know that only three hundred and fifty years ago the world was in the depths of a prolonged cold spell called the "Little Ice Age," which lingered for nearly 500 years. Twenty thousand years ago, in the middle of the last glacial period, large continental scale ice sheets covered much of North America, Northern Europe, and Northern Asia. Fifty million years ago, global temperatures were so high that there were no large ice sheets at all. We need to ask several questions: What happened? Why did it happen? Has it happened before? Will is happen again? How do we know about it in the first place? Click the image to the right to explore the hypothesized changes in ice cover and vegetation. 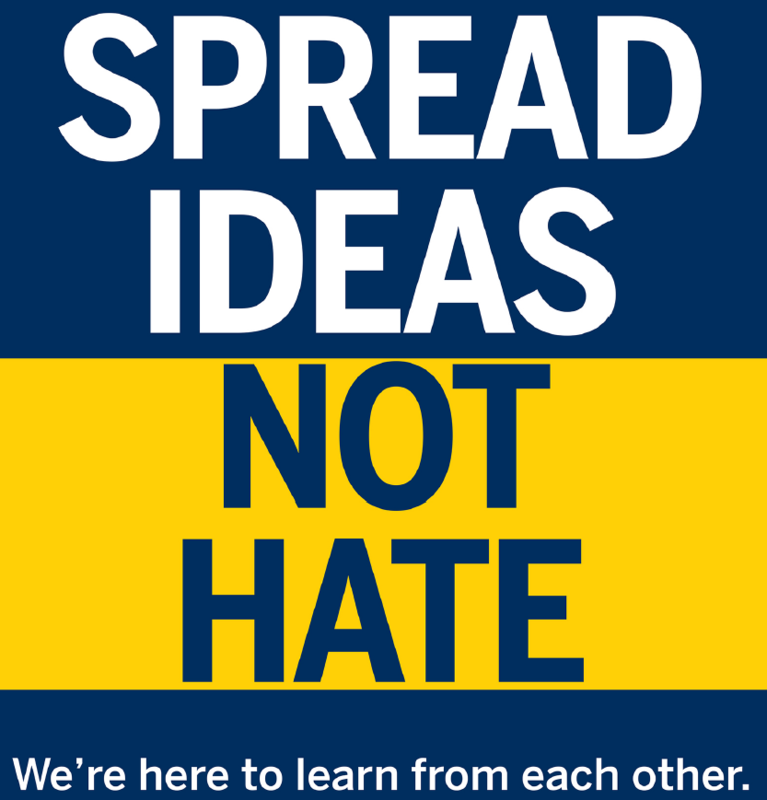 University of Michigan students can access this Science On-Line article through this link. Isotopic Geochemical Studies: The study of rock isotopic ratios, ice core bubbles, deep sea sediments, etc. Pollen Distribution: the study of plant types and prevalence from pollen found in sediments, ice, rocks, caves, etc. Fossils: Studies of geological settings, etc. Historical documents, paintings, evidence of civilizations, etc. Probably the most important of these methods for the study of long-term climate change involves isotope geochemistry. We have already discussed the importance of isotopes for rock dating purposes; the carbon14 radiometric technique, for example, can date as far back as 60,000 years. However, there is another important use of isotopic ratio measurements using oxygen (and other elements) that is not dependent on radioactivity, but rather on the interaction between life processes and isotopes. Oxygen is composed of 8 protons, and in its most common form with 8 neutrons, giving it an atomic weight of 16 (O16) -- this is know as a "light" oxygen. It is called "light" because a small fraction of oxygen atoms have 2 extra neutrons and a resulting atomic weight of 18 (O18), which is then known as "heavy" oxygen. O18 is a rare form and is found in only about 1 in 500 atoms of oxygen. The ratio of these two oxygen isotopes has changed over the ages and these changes are a proxy to changing climate that have been used in both ice cores from glaciers and ice caps and cores of deep sea sediments. Many ice cores and sediment cores have been drilled in Greenland, Antarctica and around the world's oceans. These cores are actively studied for information on variations in Earth's climate. A summary of the results of isotopic geochemistry is available here. Ice in glaciers has less 18O than the seawater, but the proportion of heavy oxygen also changes with temperature. To understand why this might be so, we need to think about the process of glacier formation. The water-ice in glaciers originally came from the oceans as vapor, later falling as snow and becoming compacted in ice. 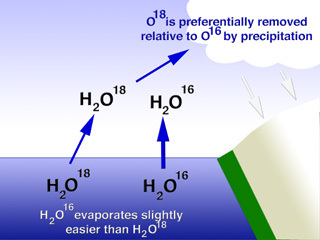 When water evaporates, the heavy water (H2O18) is left behind and the water vapor is enriched in light water (H2O16). This is simply because it is harder for the heavier molecules to overcome the barriers to evaporation. Thus, glaciers are relatively enhanced in O16, while the oceans are relatively enriched in O18. This imbalance is more marked for colder climates than for warmer climates. In fact, it has been shown that a decrease of one part per million O18 in ice reflects a 1.5°C drop in air temperature at the time it originally evaporated from the oceans. While there are complexities with the analysis, a simple measurement of the isotopic ratio of O18 in ice cores can be directly related to climate. Ice cores from Greenland or Antarctica are often layered, and the layers can be counted to determine age. The heavy oxygen ratio can then be used as a thermometer of old climate. Scientists have developed a technique by which global mean sea-surface temperatures can be deduced from measurements of the isotopic abundance of oxygen in ice cores. This technique provides us with estimates of sea-level air temperatures over the past 400,000 years with the latest long ice cores. In order to establish the reliability of such measurements, paleoclimatologists have conducted a number of tests to calibrate this "paleoclimate thermometer" in the ice. Figure 3. Ice-core oxygen isotopic measurements from Greenland (right hand side) and from Antarctica (left hand side). The isotope measurements can be interpreted to yield the global sea surface temperatures to ~160,000 years ago (colder temperatures to the left). The two traces are consistent with each other and depict the most recent glacial period, ending ~15,000 years ago. Figure 3 shows an intercalibration of two sets of ice core isotopic measurements, one from Byrd Station in the Southern Hemisphere, and the other from Camp Century in the Northern Hemisphere. A decrease of one part per million (ppm) in the del18 O measurement is equivalent to a reduction in temperature of approximately 1.5oC at the time that the water evaporated from the oceans. Again, lighter isotope ratios mean more negative del18O values (less 18O) mean colder temperatures. Clearly the two sets of measurements are correlated, both showing the temperature reduction of the most recent Pleistocene glacial outbreak between 60,000 and 15,000 years ago. The warming trend to the present interglacial period started around 15,000 years ago. The dates for such measurements are obtained using models of ice deposition and flow. 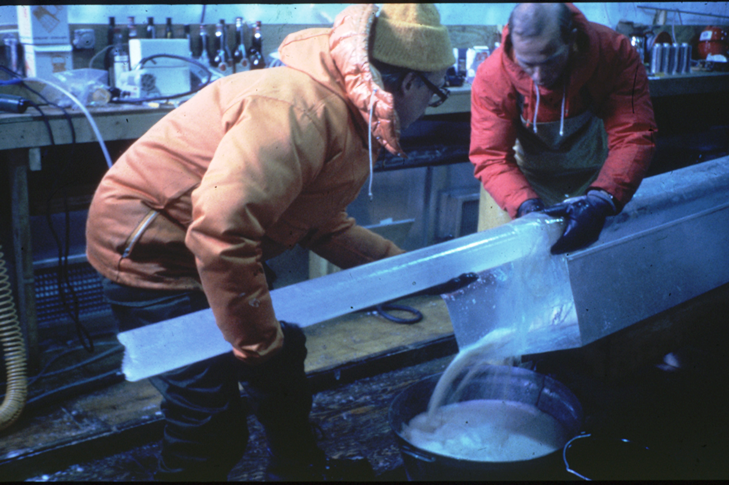 The ice-core oxygen isotope measurements are complemented by studies of the composition of ancient air trapped in bubbles in the ice. The ice is brought back to a laboratory and heated carefully in a vacuum chamber (to avoid contamination by modern air), releasing the ancient air for analysis. Figure 4 shows the results of ice bubble analysis for the atmospheric gas methane (CH4). The dots represent ice measurements of methane, while the "line" represents atmospheric measurements of the methane abundance global average from the late 1970's. These analyses have shown that methane concentrations have hardly changed over most of the 160,000 year period, staying at values near 750 parts per billion At about the time of the industrial revolution, however, methane concentrations rose, due in part to the production of the gas by enteric processes in cattle, anaerobic processes in rice paddies, and other human-driven activities. The recent rise in methane from pre-industrial levels is more than a factor of 2, so that today we have methane values of ~2,000 parts per billion in the atmosphere! We have seen how ice cores can provide information on both temperatures and atmospheric composition for ancient times. Let's put the two pieces of evidence together and assemble a more detailed 160,000 year record of climate. 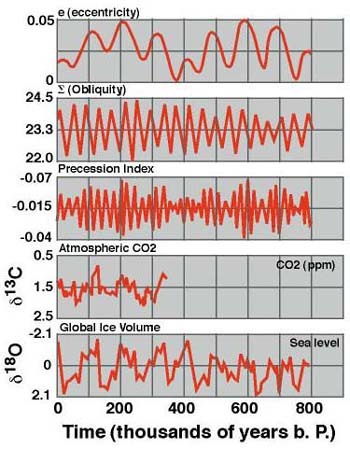 Figure 5 shows the time series of ice-core data for temperature (oxygen isotope measurements) and for carbon dioxide and methane abundances (ice bubble measurements). The most recent rise in methane and carbon dioxide is not shown on this scale. The comparison is dramatic - all three curves show similar features! The top part of Figure 5 shows the temperature data for the past 160,000 years. The present (near left-hand side of graph) is relatively warm compared with the last period when glaciers covered Michigan ~18,000 years ago. The period of extensive cooling was marked by repeated advances and retreats of the glaciers. Both methane and carbon dioxide correlate with temperature - i.e., an increase in temperature is associated with an increase in the abundance of both these two gases. It is unclear whether the gas abundance changes are a consequence of the temperature changes or vice versa. Correlations such as these are difficult to interpret. It is hard to unravel the chain of cause and effect when a poorly understood feedback process is at play. Additional evidence for these processes are sought. As we shall soon discuss, useful additional evidence comes from a study of changes in the Earth's orbit. However, once thing is certain, as discussed in previous lectures -- it is simple physics that as the concentrations of heat-trapping gases like CO2 and methane increase in the atmosphere, more heat is trapped next to the surface of the Earth and the temperature of the earth's atmosphere and oceans warms. Figure 4 (left). Ancient air found in bubbles trapped in ice cores (above, temporary picture) may be carefully analyzed to provide information on the atmospheric composition. Figure 5 (right). Correlations between the Ice Core measurements of paleoclimate temperatures and abundances of methane and carbon dioxide. The same isotopic analyses can be made in ocean sediment cores on the shells of dead marine organisms (Figure 6). Some of these organisms are made up of calcium carbonate (CaCO3), and the oxygen in the carbonate reflects the isotopic abundance in the shallow waters where the creatures lived. Thus if we can find and date ever more ancient sediments made up of old sea shells, we can determine the isotopic ratio of oxygen and infer the sea surface temperature at that time. The more O18 found in the sediment, the colder the climate (inverse relationship to that of glacier ice). The paleoclimate record from ice cores goes back about 400,000 years. Compared with the history of the Earth, this is a very short period of time indeed. We can go back farther, however, using measurements made of oxygen isotope ration in deep sea cores, drilled from the ocean floor. Analysis of oxygen isotopic ratios of ocean and atmospheric water oxygen isotopes has shown ocean surface sea water becomes enriched in heavy oxygen due to the temperature-dependent evaporation process. It follows that sea creatures living in these waters will possess shells containing more heavy oxygen. The proportion of heavy oxygen in sea shells (consisting of calcium carbonate -- CaCO3) will go up in years when the temperature is colder and will go down in years when the temperature is warmer (exactly the opposite behavior to the heavy oxygen in glacial ice discussed above). Several deep sea cores have since been analyzed to determine the oxygen isotopic ratio of ancient calcium carbonate. It is from these these measurements and careful calibrations that we can obtain a record of sea surface temperatures that goes back almost 1 million years! Figure 7 shows the million-year paleoclimate record (bottom panel), together with more detailed records of successively more recent times. To generate this figure, additional information has been used from the techniques noted on the right hand side of the diagram. It should be remembered that 1 million years represents only about 1/50 of 1% of the Earth's lifetime. We start our discussion with the one-million-year time series (Figure 7, Panel e). Note that the record from the deep sea sediments shows cycles of alternating cold and warm periods with a period of about 100,000 years. Superimposed on this long-term cycle are multiple excursions on shorter time scales. Clearly Michigan has been subject to many periods of glaciation over the past million years! If we focus on the last 150,000 years only (Panel d), we see the glacial/interglacial features already indicated in Figure 3. The recent warming trend started in ~15,000 years ago (Panel c), when the glaciers last left Michigan . This warming coincides with the development of human civilization. Panel c also shows a phenomenon of interest to us - the Younger Dryas. This was a short-lived period lasting about 700 years that occurred 10,000 years ago, when the general warming trend was interrupted by a sudden cooling. The term Younger Dryas was coined from the herbaceous plant "dryas" that covered much of the landscape during the colder time period. Evidence for this sudden cooling came from the study of ancient pollen grains found in sediments, which showed a abrupt change from pre and postglacial forests to glacial shrubs and then back again. This climate "jump" was also seen in ice core measurements of CO2. The Younger Dryas provides dramatic evidence for rapid jumps in climate. We shall see in a later lecture, this phenomenon should be taken as a warning of possible things to come if rapid human-induced climate change continues. Panel b of Figure 7 shows the record of the past 1,000 years. The climate about 1,000 years ago was relatively warm and dry (wine was grown in England !). We know from history that this was also the period that the Vikings ran out of room in Scandinavia and colonized Greenland (remember, it doesn't look very green now). Unfortunately for them, the period of relatively clement climate was replaced by colder conditions during the famous "Little Ice Age" and Greenland became uninhabitable again. The Little Ice Age is celebrated in paintings by Breugel of frozen rivers and streams in Holland . We are clearly seeing a connection between human activities and climate. The most recent 200 years are shown in Panels a and b. During this time, global human activity significantly expanded and industrial revolution flourished. The graphs show that warming has continuously increased (with a few interruptions), resulting that the 1980's has been the warmest decade of this of the century. Figure 7 summarizes the climate record as presently understood and lists some of the techniques used for the measurement. The most commonly used indicators include pollen, faunal and floral remains, sediment types or composition and geomorphological features indicating physical conditions. In the ocean, indicators such as microplankton, pollen, and sediments settle to the sea floor, where they accumulate to provide a nearly continuous record of climate for millions of years. The top panel summarizes the last century, and animations of the Temperature Record from 1856 to 1997 are available to explore spatial trends in temperature. Techniques that identify the actual geological time represented by the evidence. Techniques are limited and rely predominately on evaluating the amount of decay of naturally occurring radioactive isotopes. Techniques that are able to differentiate time relative to other points in time. Stratigraphy establishes a relative sequence of events or characteristics within which the evidence lies. If this same sequence can be identified in multiple locations it can be used to establish the relationship between locations and the relative timing of the indicators. It is clear from the above discussion that climate change is always occurring, and that it occurs at all time scales. We next need to discuss the causes for paleoclimate change. In this discussion, we will start with the most ancient changes and move to the more recent changes. Of course, much of what follows is speculation and our picture will undoubtedly change as new paleo-climatological techniques are developed. We will separately consider climate changes over several different time scales: 1) the long term (100's million years); 2) medium term (1 million years); 3) short term (160,000 years) and 4) modern period (last few centuries) - the modern period will be discussed in subsequent lectures. The long term (100's million years) paleoclimate record, shown in Figure 8, is characterized by relatively few, isolated glacial outbreaks - the great Ice Ages. We need to seek a factor, or a combination of factors, that could change the climate in this way over these long periods. The time scales and nature of the record argue against solar output and Earth's orbit changes to explain the great Ice Ages. Radiation from the Sun is not constant, but varies at least by ~0.1 to 0.2%. There is an 11 and 22 year cycle of sunspots that causes a similar cycles of solar radiation. This cycle is thought by many scientists to play a minor role in climate change (though this is still subject to heated debate). Over longer periods, it is known that solar activity changes (as recorded by number of sunspots). It is interesting to note, for example, that during the "Maunder Minimum" (~1645-1715) few if any sunspots were seen. This corresponds to the peak time of the Little Ice Age. Sunspot cycles have much too short a period (time of recurrence) to explain the great Ice Ages and we need to look for variations in solar output over much longer time intervals. Here we can appeal to plasma physics and to what is known about stellar evolution. Solar physicists believe that stars like the Sun brighten slowly over billions of years. In fact, the sun is thought to have been 30% dimmer 3 billion years ago than it is today. This slow increase in solar radiation with time does not help us explain the great Ice Ages, however, since one would then expect a record that followed the slow curve of solar radiation rather than the episodic plot of Figure 8. Although it is based on fundamental physical principles, the dim early sun is not an immediately helpful concept for paleoclimatologists, although it may have related to an early cool period sometimes called "snowball Earth". It is also often called the "Faint Young Sun Paradox" since, if the sun were really that dim, one would have expected quite a different story for planetary evolution. Changes in the nature of the Earth's orbit around the Sun, known as Milankovitch Cycles, occur over too short time scales to explain the long term climate change. These cycles are discussed below with reference to the medium-term changes. So what then caused the Great Ice Ages? Let us consider the possibility of changes in the atmospheric greenhouse effect. Our best guess today is associated with the very slow process known as "Plate Tectonics" and its influence on the atmospheric greenhouse effect. We discussed Plate Tectonics in greater detail earlier in this course. To review, it is sufficient to know that the continents (plates) "drift" on top of a fluid substrate over geologic time. When plates collide, some material can be pushed under the Earth's crust in a process known as "subduction", leading to increased volcanism. Over the time scale of 300 million years (back to the last known Great Ice Age - the Gondwanan, see Figure 8), the continental plates have moved greatly. Figure 9a shows the distribution of continents today, together with the areas showing evidence of Gondwanan glaciation. Figure 9. Top panel shows distribution of today's continents and regions of glaciation associated with the Gondwana Ice Age. Bottom panel shows the supercontinent Pangea (~300 million years ago), with the continents reassembled according to the theory of continental drift. Figure 9b shows the locations of the continents ~300 million years ago when they were assembled into the great supercontinent Pangaea. It can be seen that the regions showing glaciation were all assembled near the South Pole. The question remains as to why the temperatures dropped. Perhaps the answer lies in changes in the natural (non-biogenic) production rate of carbon dioxide - the number one greenhouse gas. We know that CO2 is produced in volcanoes and in the mid-ocean trenches. It is lost by being slowly absorbed in the oceans. Both of these processes are very slow - about the right time scales to explain the great Ice Ages. A drop in the production rate of carbon dioxide by volcanism would reduce the atmospheric greenhouse effect and lead to lower temperatures. We may speculate that the Gondawanan Ice Age started when the moving continental plates first assembled in Pangea (like bumper cars), they had to go through a readjustment period before drifting apart again. Perhaps, during the readjustment period, the production of carbon dioxide dropped, leading to the Gondwanan Ice Age. Figure 10 shows how carbon dioxide is produced by volcanism and sea-floor spreading. During times of rapid spreading, increased volcanic activity, coupled with higher ocean levels and reduced chemical weathering of rocks, may promote global warming by enriching the CO2 content of the atmosphere. Similarly, global cooling may result from stalled or slowed spreading. Figure 10. The Earth is composed of a series of moving plates whose motion may influence climate change on long time scales. The medium term changes in paleoclimate temperatures were illustrated by Figure 7e, above. This period, called the Pleistocene (last 2.5 million years), was characterized by semi-regular advances and retreats of the glaciers during the most recent (and continuing) Great Ice Age. The best clue for explaining these changes comes from a consideration of the Milankovitch cycles, changes in the orbital characteristics of the Earth (this was introduced in an earlier lecture). There are three types of orbital change of relevance to our discussion. These were first described by the Yugoslavian astronomer Milutin Milankovitch who first proposed the idea of a climate connection in the 1930's. Figure 11. Eccentricity changes on a ~100,000 year cycle. The basic premise of the theory is that, as the Earth travels through space, three separate cyclic movements combine to produce variations in the amount of solar energy falling on the Earth. Figure 11 illustrates the first type of orbital change, dealing with the changes in the shape of the Earth's orbit (eccentricity) as the Earth rotates about the Sun. The more eccentric the orbit the more elliptical the orbital shape. It turns out that the Earth's orbit goes from quite elliptical to nearly circular in a cycle with a period of ~100,000 years. Presently, we are in a period of low eccentricity (~3%) and this gives us a seasonal change in solar energy of ~7%. When the eccentricity is at its peak (~9%), the "seasonality" reaches ~20%. In addition a more eccentric orbit will change the length of seasons in each hemisphere by changing the length of time between the vernal and autumnal equinoxes. The second Milankovitch cycle takes about 41,000 years to complete and involves changes in tilt (obliquity) of the Earth's axis (Figure 12). Presently the Earth's tilt is 23.5°, but the 41,000 year cycle varies from ~22° to 24.5°. The smaller the tilt, the less seasonal variation there is between summer and winter at middle and high latitudes. For small tilt, the winters would tend to be milder and the summers cooler. This would lead to more glaciation. The third cycle is due to precession or "wobble" of the spin axis (as in a spinning top) and occurs over a ~23,000 year cycle. Presently, the Earth is closest to the Sun in January and farther away in July. Due to precession, the reverse will be true in ~11,000 years. This will give the Northern Hemisphere more severe winters. Figure 13 shows the correlation of the Milankovitch cycles with the paleoclimate records for the past million years. There is a good correlation, between periods of low eccentricity and glacial periods. A detailed view of the interglacial periods of the past ~160,000 years also shows evidence of the 41,000 year and 23,000 years cycles. Figure 12. (Temporary picture) Changes in tilt (obliquity) and precession occur on time scales of 41,000 years and ~23,000 years, respectively. Figure 13. Correlation of the Milankovitch cycles and paleoclimate change. The Milankovitch cycles may help explain the advance and retreat of ice over periods of 10,000 to 100,000 years. However, they do not explain what caused the Ice Age in the first place; this is likely a function of longer-term changes in Earth's continent configuration or other aspects of Earth's climate variability that we have yet to fully understand. When all the Milankovitch cycles (alone) are taken into account, the present trend should be towards a cooler climate in the Northern Hemisphere, with extensive glaciation. That is, we should be heading into another ice age. What we see instead is a rapid warming of the climate that has no other explanation than the increase in heat-trapping gases that humans are emitting to the atmosphere. In future lectures we will examine more closely the mistaken ideas that "sunspots" or "volcanoes" have caused the recent warming on Earth. The Earth's climate has changed dramatically in the past, apparently in response to natural changes in orbital characteristics and topography (plate tectonics). We are able to deduce past climates through multiple techniques but much of the progress in resolving Cenozoic climate change has resulted from oxygen and carbon isotope records. A paleoclimate record has been developed using different techniques, stretching back over 2 billion years. The Earth was warmer than at present for most of this time, punctuated by infrequent Ice Ages. The Great Ice Ages may have been caused by processes associated with continental drift and greenhouse warming. The interglacial periods are related to orbital changes described by the Milankovitch cycles, among other factors.